At Villarrica you will have the unique experience of skiing at the foot of the most active volcano in Chile in the heart of the famous Lake District. The Volcan Villarrica steams surreptitiously from 9,317 ft. (2,840 m) high above the elegant Chile ski slopes. On a clear day you can hike to the crater and watch the molten magma bubble. It is a two-hour hike from the highest ski lift, giving you an extra long ski run on the way down. The volcano is one of many that run along Southern Latitude 36° of the Andean Cordillera. The town of Pucon, the adventure capital of Chile, lies only 7.4 mi (12 km) away. Here you can enjoy a wide array of activities, from rafting, horseback riding, fly-fishing, parachuting, archery, mountain biking or hiking. There are also natural hot springs and waterfalls. An exciting nightlife and fantastic accommodations make this Chile skiing destination a must on anyone’s Chile ski holiday. The epic run from the lip of the steaming Volcan Villarrica sends you back down 5,380 vertical ft (1,640 m) to the base. You will swish through broad treeless slopes, try out your stunts on the half pipes carved by lava flows, and zip down the steeps. Cornices and wind lips also provide awesome opportunities for advanced skier delight. At Pucon - Villarica you will find some of the best backcountry skiing in South America, with miles and miles of fantastic terrain and fantastic views. 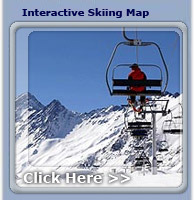 The Chile ski school offers group and private instruction and can be found both in town and on the mountain. South America skiing does not get better than this! When you have had your day of exploring the 24,710 acres (10,000 ha) of skiable terrain, pop off your boots and enjoy a hot cocoa at the ski reort lodge. Then head into Pucon where there are a variety of hotels, cabins, and hostels. Foreign travelers do not have to pay the 18% lodging tax, so ask when you book your ski Chile accommodations. Pucon is the hotspot for a night on the town while skiing in Chile here. You can also enjoy the Posones hot springs set on Lliucura River just outside of town. After your soak you may like to spend the evening in the town of Ecole, a hostel known for its exceptional vegetarian cuisine.